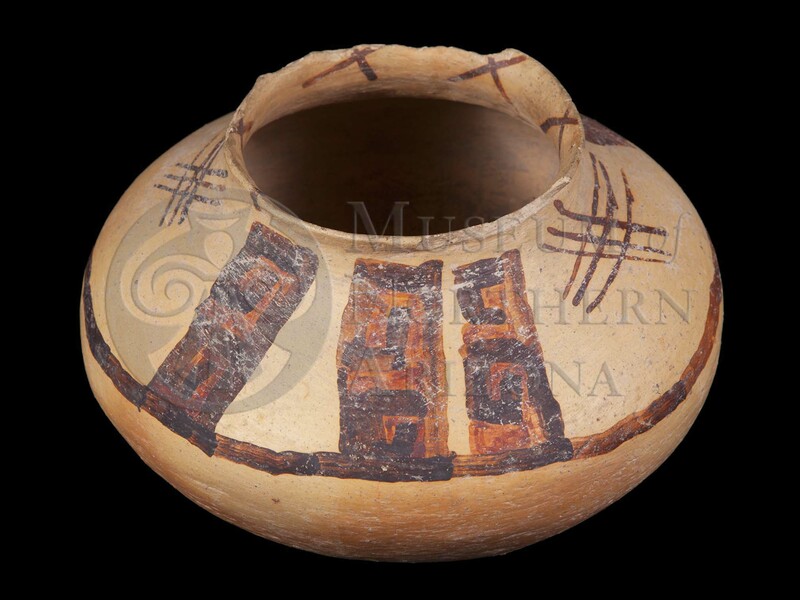 San Bernardo Polychrome jar from the Museum of Northern Arizona collections. Click the image to open the San Bernardo Polychrome gallery. San Bernardo Polychrome, a type of Polacca Yellow Ware, strongly resembles pottery from the Sikyatki Polychrome type that preceded it on the Hopi Mesas of Arizona, with the primary differences being in execution and design motifs/elements. Date Range: A.D. 1625-1700 (per Kelley Hays-Gilpin, Northern Arizona University). Firing: In an oxidizing atmosphere (dung fired). Core Color: Yellow or buff. Temper: Temperless, or small amounts of clay fragments, iron manganese nodules, sand, and/or red angular fragments in small amounts; rarely visible. Surface Finish: Smoothed and polished. Surface Color: Yellow, orange, and pinks with fire clouds. Forms: Bowls, jars; water jars globular. Paint: Brownish black; brownish red (matte). Design: Spanish influenced: eight-pointed stars, Maltese crosses, arabesques, rosettes, crosses, circles with radiating lines, and quadrupeds; no katchina faces or figures, but feathers common; designs often poorly executed; rims generally painted red; black tick marks or short lines on rim interiors common. Comparisons: Designs are similar to early Sikyatki Polychrome but differ in being crudely executed, thicker pattern, and lack of katchina faces and figures and red-painted rims; San Bernardo Polychrome also often has 2-4 equally spaced sets of black tick marks or short lines on rim interiors; San Bernardo Polychrome tends to have thicker vessel walls, as well. Payupki Polychrome Variety A is similar, but lacks Spanish-influenced designs and vessel forms, and typically has red-slipped bases.